Georgia Davies broke a second Welsh record in successive days but Lizzie Simmonds sealed her World Championships spot in a bizarre race in Sheffield. Davies swam the first half of the 200m backstroke final in a Welsh 100m record time of 59.60 seconds. But she slowed in the second half as Simmonds added the 200m National crown to her 100m title in the second fastest time in the world in 2011. Double Olympic champion Rebecca Adlington won the 800m freestyle. 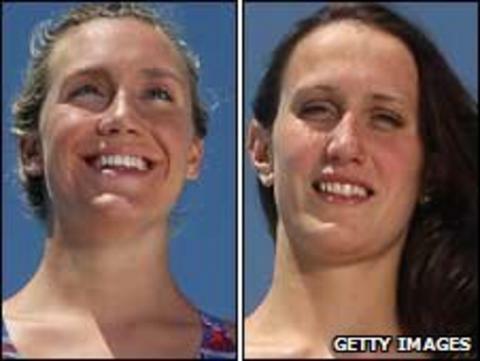 The 22-year-old overcame a recurring illness that has affected her training but produced a world-class swim as Adlington won by 20m in a time of eight minutes 24.77 seconds, finishing ahead of Eleanor Faulkner and Hannah Miley. "I am really pleased with that time coming here unrested," said world number one Adlington. Adlington qualified for the 200m, 400m and 800m freestyle events at next month's Worlds at the first set of trials in Manchester. And Simmons will join her in Shanghai in both the 100m and now 200m backstroke after the European champion's demolition of the rest of the field at the National Championships in Sheffield. Davies dominated the opening half of the final as she took the Welsh record split time for the 200m backstroke to under a minute - adding the 100m mark to the Welsh 50m backstroke record she claimed on Wednesday. The Swansea swimmer was second going into the final of the 100m backstroke earlier in the week but was excluded after arriving late at the call room where swimmers report before their race. But the Commonwealth 50m backstroke bronze medallist's opening 100m time on Thursday would have been good enough for National victory on Tuesday. The 20-year-old coasted the second half of the race as the 50m and 100m backstroke specialist allowed Simmonds to take charge. And she did so in emphatic fashion as the Loughborough swimmer made amends after failing to hit the Worlds qualifying mark at the British Championships in March. Simmonds booked her 100m Shanghai spot on the first night of the Sheffield trial and her world-class effort of two minutes 07.49 seconds in the 200m places her just one second behind Australia's Belinda Hocking's fastest time in the world this year. "I've been training a lot better than I was before the trials [in Manchester]," said Simmonds. "To come here and produce major times for this year, that is a significant step forward." Chris Walker-Hebborn added a World Championship berth in the 100m backstroke as he did the backstroke double over Marco Loughran. Walker-Hebborn beat the Welsh swimmer to Wednesday's 200m title and did likewise in the shorter distance as fastest-qualifier Loughran missed his final World Championship chance. Simon Burnett booked a 50m freestyle spot in Shanghai with victory in Sheffield but Amy Smith was 0.03 seconds off qualifying in the women's equivalent as Stacey Tadd just missed out in the 100m breaststroke. Dan Sliwinski won the 50m breaststroke but as a non-Olympic event it does not qualify him for the Worlds, while Lewis Smith took the 400m individual medley ahead of Wales' Tom Haffield, but both Shanghai spots had already been taken.